Another option for Schreiber would be to give the prize for the discovery of the role of histone modifications in transcriptional regulation and split it between Michael Grunstein (discovered the importance of histone tails in transcriptional regulation), C David Allis (discovered that histone acetylases regulate transcription) and Schreiber (discovered that HDACs regulate transcription). "For Medicine I nominate professor Denis j salmon; Nicholas Lyndon; Bram j duker & cheris L Swear for imatinib in Chornic Myeloid lukemia; my 2 nd choice is Emmanuel Charpentier for CRISPER /cas9 and gene editing and for treatment of cancer and 3rd is Alexender Y Rudanesky shiman Sakagnchi Evan M Shervach for Treg cells"
"For literature prize my nomination will be in following orders 1) Haruki Murakami of Germany 2) Milan Kundera for his book "Immortality" 3) pauello cohello for his book Brida & The winner stands alone 4) Philip Roth 5) Joyce carol Oates both American novelist"
For peace prize my nomination for long years together but not yet obtained Gene sharp of Albert Eisenstein institution US or Good Luck Ebele Jonathan of south Africa"
I wrote about my guesses. I commented on possible pairing of Schreiber and Allis that Bryan mentioned above. In the case of chaos theory it's hard to say where physics ends and mathematics begins. There have been a number mathematicians (many of them already dead) working in the field of dynamical systems and it'd be hard to pick any three. With OGY there's at least a clear set of three candidates and the work was published in PRL instead of some mathematics journal. But even that would seem to me a very unusual choice for Nobel physics prize. Usually the prize is given for something more concretely 'physical'. I think this year's physics prize is the easiest to predict in many years. In 2013 it was clear what the prize would be for (Higgs boson), but there was at least the question of which ones of the more than three possible candidates would get the prize. This time with LIGO there's really no question. Shouldn't Holm be with Gray and Lippard for the potential bioinorganic one? All the same, discovering not just crucial aspects of a new phenomenon, but also a universal constant about it, using nothing but a hand-held calculator?.... Boy, that's what at least I associate with the Nobel. The Nobel Prize in Medicine and Physiology it is mine without any doubt. 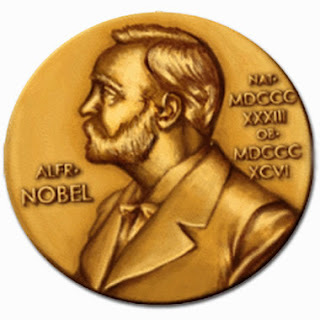 I am extremely delighted to be one of the Nobel Laureates this year. Should definitely include S. Chandrasegaran -- the inventor of the original gene-editing technology (zinc-finger nucleases) -- as a Nobel candidate in Chemistry [see J Mol Biol. 2016 Feb 27;428(5 Pt B):963-89].